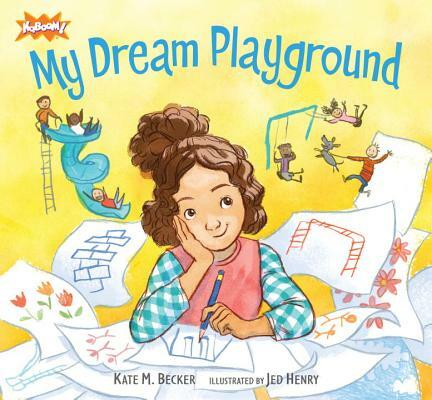 A resourceful little girl with big ideas becomes a key part of the team when a community of family, friends, and neighbors builds a playground. Right now there is just an empty lot down the street, but this little girl dreams that one day there will be a playground — a real playground, a fun playground — right in her own neighborhood. When she sees a man measuring the empty lot, she’s sure that he’s there to help make her playground dream come true. And he is! Inspired by the real story of the first-ever playground built by KaBOOM!, a national nonprofit that has helped build more than two thousand play spaces across the country, here is the tale of how a determined young girl, with the help of her family, friends, and community, makes her dreams of a playground in her own neighborhood a reality. KaBOOM! is a national nonprofit dedicated to bringing play to kids who need it most. Their mission is to create great playspaces through the participation and leadership of communities. Founded in 1996 by Darell Hammond, KaBOOM! envisions a great place to play within walking distance of every child. Learn more at kaboom.org. Kate M. Becker is the vice president for program management at KaBOOM!. She lives in Washington, D.C.
Jed Henry has illustrated several children’s books. This is his first with Candlewick Press. He lives in Utah. Henry’s digital illustrations have the look and feel of watercolors, and the pages of the young girl’s drawings are charmingly childlike in their detail, execution and use of imagination. ... This book may inspire more than dreams. The story ... captures the child’s excitement and could spark discussions on community engagement and teamwork.